Yesterday morning when I woke up I was feeling like crud – like in the sharp sheering, gut-wrenching, ohmygawd my stomach is being ripped apart crud – and I’ll be honest, the last thing I wanted to do was go for a ride. But it had been weeks since our last ride together, in fact I think it was my birthday. We were supposed to go last week but the rain and migraine got in the way of that, and I knew if I didn’t go and then started to feel better, I’d be kicking myself for the entire rest of the day. So, I geared up. Mario rode towards UBC while I drove … I’ve decided I much prefer starting my rides at UBC rather than riding out to UBC as it gives me more time in the city. We turn left and ride along Marine, which is like a never-ending road of slight incline, which seriously pisses me off, because it looks flat, so flat I should be making good speed, but noooo, that invisible hill has me going at a snail’s pace for like 500 km. Mario thought, because I was feeling like the aforementioned crud, I’d choose the so-called “easy” route, and so he turned left right off the hop. But the thing is, despite my huffing and puffing, and my cursing and glaring, I like Camosun. The hill is hell, but it’s a quick hill, and I know once I peak that hill, I’ve got a seriously long downhill coming at me – who wouldn’t choose that route? And so, I clipped into my pedals, turned right and pumped my legs super duper fast, silently giggling at the thought of Mario having to turn around and catch up to me, which he did at three quarters of the way, but three quarters of the way nonetheless. One hill down. 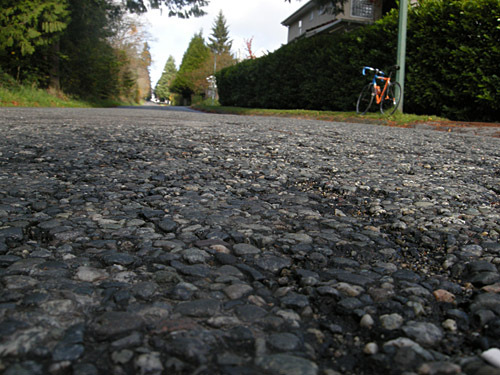 The bottom of Camosun, which by the way, is bumpy as hell to ride down! Not long into the ride, Mario made mention of us possibly going down the “big” hill to Spanish Banks, but quickly hedged back on the thought, figuring I wouldn’t be up for the climb back up Jericho: 90 metres elevation, 81 metres climbing, 2 km distance. “Well, I’ve got to do it at some point,” I said. And I kid you not, Mario’s eyes instantly twinkled and within minutes we were zooming – I mean ZOOMING – down the big hill. Before climbing back up, we stopped at Greek Days on Broadway and noodled around for a bit. It was there that I realized, I couldn’t turn my bike computer off and that it was still recording my average pace, which given that we’d been walking – SLOWLY– around for a good 15 minutes, my pace drastically dropped, which totally annoyed the hell out of me. So the entire route to Jericho, I was pedaling as fast as I could, trying to get my pace back up to a decent average. But then, I had to climb Jericho and the pace majorly took a nosedive again. Two hills done. We stopped at Malones for a patio lunch with our bikes, and I started to gripe about my lost average, and Mario said, “Well, we could just go down the big hill again…” Without thinking it through, I accepted the challenge. Two down/up Jerichos in one day PLUS an up/down Camosun, that’s never before been heard of in Princess history. I so deserved that chocolate chip cookie from Mix Bakery, one of the best bakeries EVER! Three hills done. 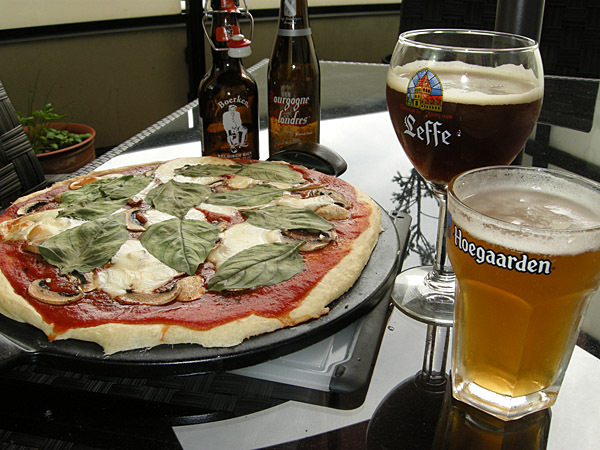 And I so deserved half this funghi pizza and a nice cold glass of Belgian beer too! Just look at that pizza! And the dark beer! Yum! Yum! Yum! This entry was posted in Training and tagged Camosun hill, Cycling, Jericho hill. Bookmark the permalink. Sounds like a great time. I love hills! I should rephrase that, I love hills early on in the ride. After 80km they start becoming difficult. I once had a computer that was totally SCREWY and would spin away when I was stopped. I never could fix it and had to replace it. the pizza looks really really delicious!